The Krispy Kreme Challenge is an annual tradition at NC State. The event, founded and led by Park Scholars, is a race that’s best described by the numbers: 5 miles, 12 donuts, 60 minutes or less. However, the Challenge is more than a gastric and physical endurance test. What started with 10 individuals has grown to more than 7,000 participants. Since its inception in 2004, the event has raised over $1.5 million for the North Carolina Children’s Hospital. 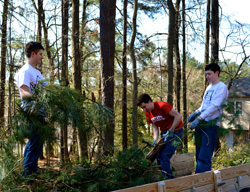 Service Raleigh is NC State’s largest student-run philanthropic project. The event was first launched in 1998 as a collaborative effort between Park Scholars and Student Government. Service Raleigh has grown to include nearly 2,000 volunteers and generates approximately 6,000 hours of community service each year to benefit residents of the greater Wake County area. Projects range from labeling storm drains with the Neuse Riverkeeper Foundation to collecting and distributing food with the Inter-Faith Food Shuttle. Founded nine years ago by a group of Park Scholars, Triangle Youth Leadership Services (TYLS) is a two-day program partners dozens of NC State students with hundreds of high school students from across the state to problem-solve real-life community challenges through a design-thinking lens informed by workshops and speakers trained to hone their creative potential. 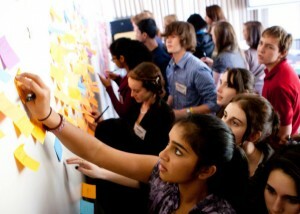 At the end of the event, they deliver a concrete solution that they, even as high school students, can pursue. In 2013, TYLS won the national Microsoft YouthSpark Challenge for Change competition and placed 2nd in the Service to Youth Category of the Jefferson Awards for Public Service. 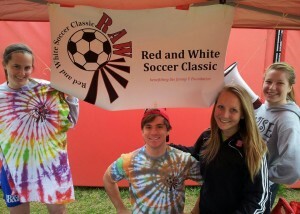 The Red and White Soccer Classic, a charity tournament that benefits the V Foundation for Cancer Research. Since its inception in 2010, the “RAW” Classic has engaged hundreds of students in soccer and philanthropy. The event was recognized as Philanthropy Event of the Year by NC State University.